QUICK TURNAROUND: The wrap process from start to finish takes on average 14-21 days since the day the order is placed. Our designers are skilled in providing a quality graphic in a short amount of time. You wont be waiting long for your wrap to be applied either. Our installers work swiftly and accurately to get you back to business with your new suit within a matter of hours. PAINT PROTECTION: Not only do wraps look incredible, but they also provide a signifcant amount of body paint protection. Whether your wrapping a complex graphic or a clear protection layer, these materials possess a 2-7 year outdoor durable lifespan. 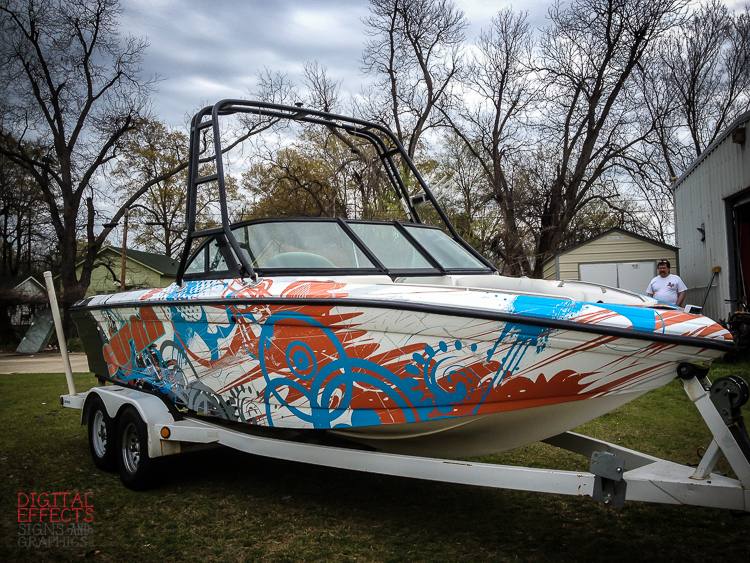 Wrap vinyl is a great choice to preserve the longevity of your paint job. VERSITILITY: Another reason wrapping is a great option is there's really not much you CAN'T wrap. Believe me, we've tried it all! From cars and trucks, to helmets, ice chests, laptops, and floors, if its something you think would look good in a wrap, then it probably will. TEMPORARY: New name? No problem! Wrapping is a smart choice because if life happens, and you need to make a change to your business name or LOGO, or just have the itch for something new, vinyl can be easily removed and/or replaced at any point. The “unwrapping” process can vary depending on how long your existing wrap has been on your product. It is wise to have your wrap inspected every 1-2 years for routine maintenance. COST FOR CREATIVITY: Wrapping is an exceptional and cost effective alternative to get creative! Your graphic ideas can be brought to life, and if you do not quite know what your style is, our sales reps and art department work enthusiastically with you to help produce your vision and guide your business to success! ..and there you have it! The top 5 reasons why wrapping is the better choice. 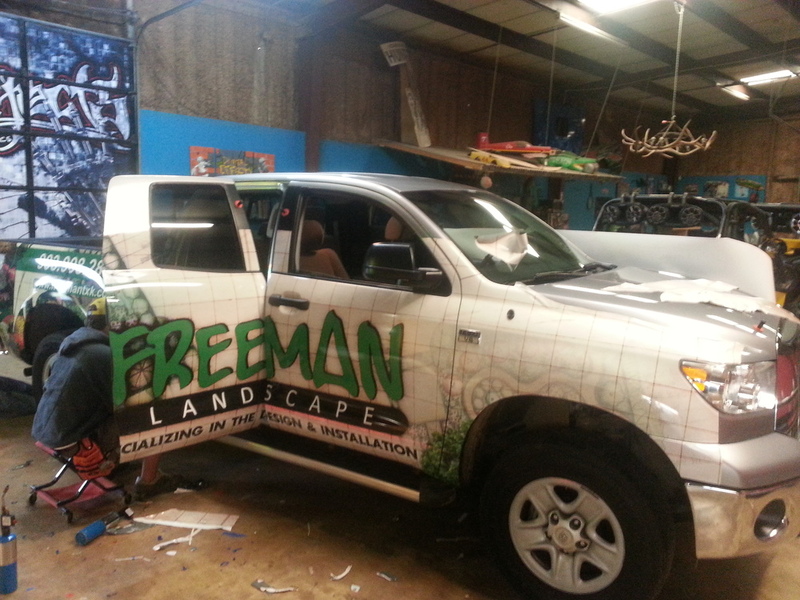 Call our office for your free quote on your wrap today! Barely fit it in the door, but we finished this shredder truck wrap for Sustainable Services in one day! Looking for something different? Applying a vinyl graphic under our matte metallic wraps adds a subtle touch to any wrap! Call or email us to talk about options and pricing. That's right. Memorial Day weekend. We all know what that means. Good times with good friends. Whether you're at the lake, riding trails, knee deep in mud, or floating a lazy river, we hope everyone has a fun and safe weekend! And if you see anyone with DEWRAPS on their gear, tell'em we said hi! That's right everyone, summer is upon us. 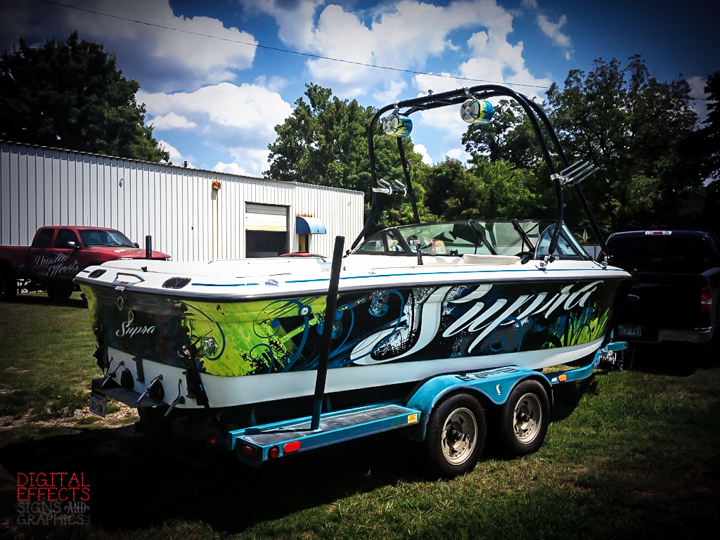 Looks like it's about time to pull the cover off that boat and get it ready for blue skies and clear water. Why not throw on a wrap while you're at it? Just finished up a fun wrap for our friends at Dermagraphic Studio. 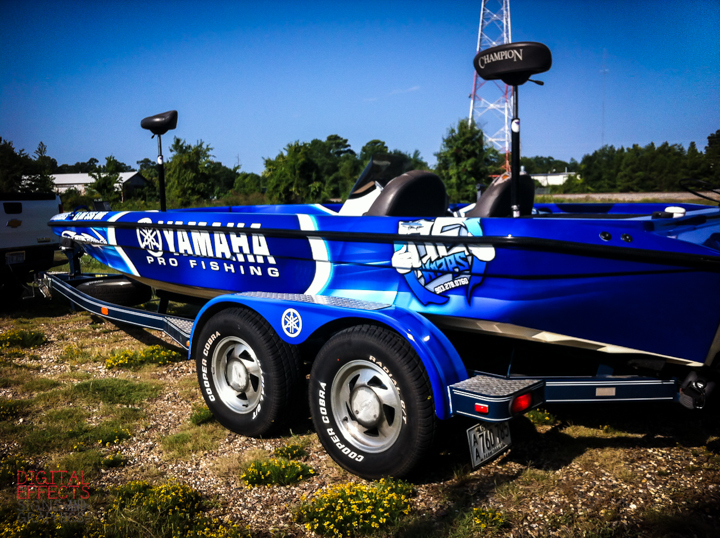 Texarkana's oldest tattoo shop now has the newest wrap!! Getting this week off to a good start! The boys have been working hard all week. We've got a pretty busy schedule right now. If you need a wrap, sign, banner, etc. Now would be the time to get your order in! Got an early start today. So, it's been a long time coming, but here it is, the new and improved Digital Effects website. Be sure to check in often on the blog to see what's going on around the shop!